There is a definite appeal to life on the high sea, cruising into vast and dangerous unknowns, with just the wind at one’s back, and wood beneath the feet. For those who are not into this kind of adventure, there are other appeals to the ocean… boats! 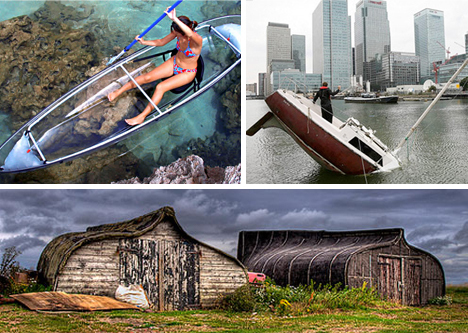 Humans have had a lot of time to experiment with boat-making, and have come up with some truly wild creations. For the true landlubber with the heart of a sailor, why not bring the boat to land? The odd buildings at the top left look like they were designed just in case Noah makes a return visit, while the top right creation is only meant to look nautical (it would be difficult to float in that one). Old boats can be recycled to create beautiful barns like these retired fishing vessels on Holy Island in the United Kingdom. 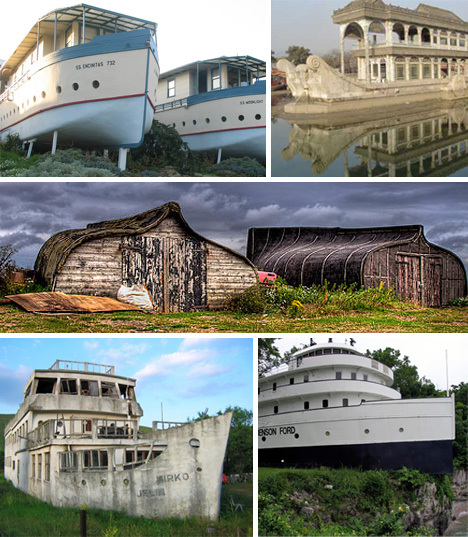 The Benson Ford is a retired vessel that still gazes out longingly at the sea, while another solidly land-based boat structure just takes on the appearance of an ocean-going ship. The Molokini is a clear kayak that is popular in Hawaii, as it allows the user to paddle around while still seeing the teeming sea life beneath them. The Baja Skimmer is a unique watercraft that looks like a mini, more agile version of an airboat and handles more like a jet ski. The HotTug is a mobile hot tub… it’s powered by a wood stove that heats the water inside to a comfortable temperature, while also providing energy to make it mobile. A barbeque dining boat might be the exact thing your dinner party needs. 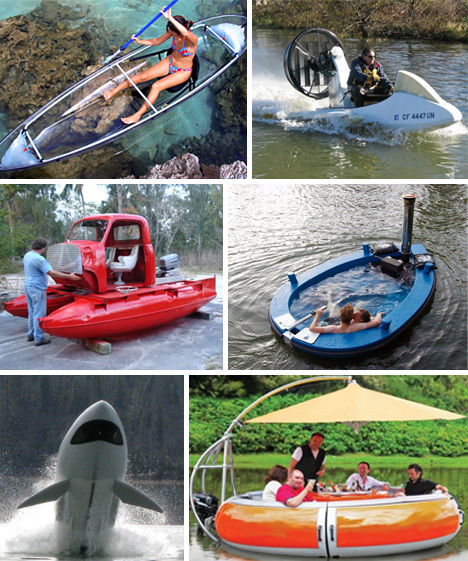 Take up to 10 adults out on the water with this waterborne food station! The Seabreecher X takes its inspiration from the most famous sea creature of them all: the shark. A video of it in action is embedded below. This last beauty is nothing but the cab of a truck on some pontoons. Whatever floats your boat, right? Concept boats can provide a great glimpse into the future of boating. 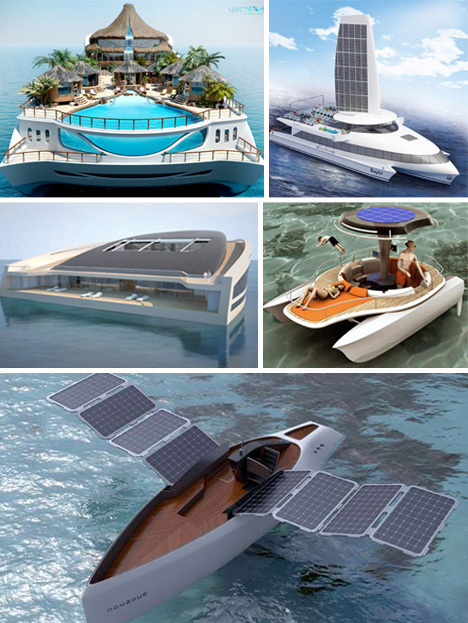 Yacht Island Design’s concept is for a floating island paradise. Take the beach out on the ocean and always have a margarita in hand! On a more serious note, Solar Sailor created this concept for a ship powered by a solar sail, harnessing the sun’s energy rather than the wind’s. For a lazy sunday, consider this solar pedal boat, which is the perfect dock for sun-bathing and diving into the lake. Novague Studio came up with this solar powered boat, with a series of solar panels that can be rolled out for a recharge. The Why yacht is huge, and meant more as a sustainable living space than a typical boat for quick transport. 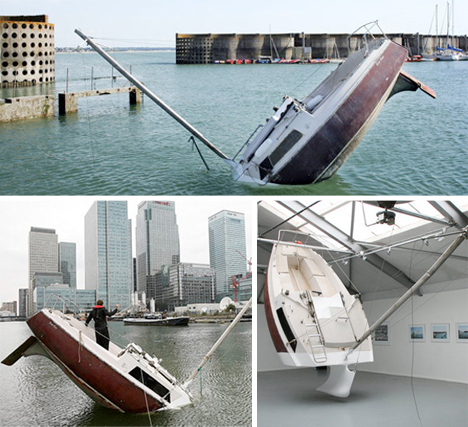 Love love is more of a sculpture than an actual boat. Yes, it floats, and can move, but it’s main purpose is to intrigue and entertain. Created by Julien Berthier, it has been taken out several times, though it is likely approached by a lot of helpful citizens trying to save someone who is clearly in “trouble”. The Python is amphibious and incredibly powerful (video below), and most amazingly, manages to look more like a car than a boat, when most amphibious vehicles tend to be the other way around. The equally sporty looking Gibbs Aquada can transform from car to boat in a stunning 12 seconds. 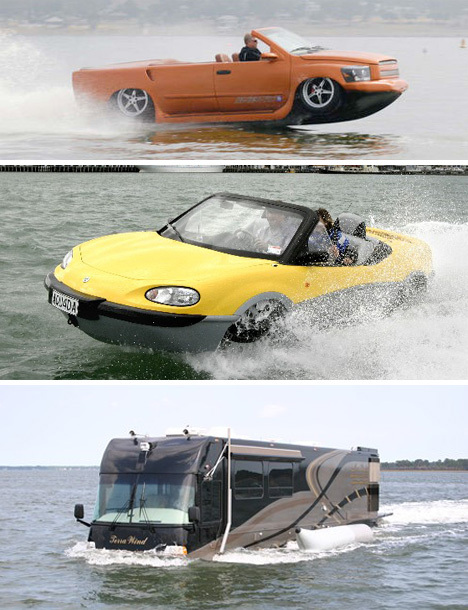 The Terra Wind is a motorhome that can be outfitted for water travel as well. It pushes the limits and is definitely more of a novelty than anything else.